Resurrection Remix Android 6 ROM is one of the most popular ROM and comes with lots of customization that you can’t find on any other ROM. Now the Official Resurrection Remix is available for Redmi Note 3 Android smartphone. The custom ROM is based on the CM, Slim.omni and original Remix ROM builds, this creates an awesome combination of performance, customization, power and the newest features, brought directly to your Device. So you can find lots of new features in this ROM. The ROM is based on Latest Google 6.0.1 Release and Cyanogenmod 13 Sources RR Customizations. To install this custom ROM on your phone all you need a rooted phone with TWRP recovery. And the best part of this ROM is that it has the SuperSU Inbuilt, os no need to root the phone. 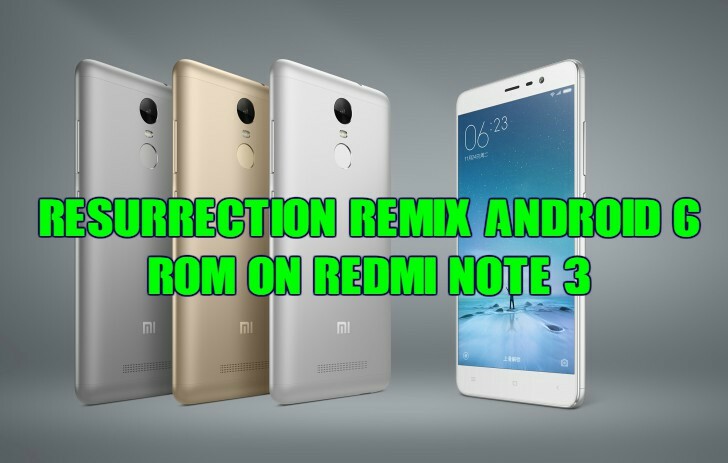 Here in this guide, we’ll discuss how to install this Resurrection Remix Android 6 ROM On Redmi Note 3 and enjoy lots of new features of this ROM. This guide is only for Redmi Note 3 phone and don’t use this guide on any other smartphones otherwise you will brick them. So without wasting your valuable time let see how to download Resurrection Remix ROM and install it. 1. As we mention above to get started you need a rooted phone with TWRP. See here how to flash TWRP on Redmi Note 3. 2. Download Resurrection Remix ROM here and save the zip file on your phone. 3. Now download Gapps zip file here and save the zip file on your phone. 4. Once both the file are saved on your phone. Boot your phone in TWRP mode. To do this first turn off your device and Hold Power Button + Volume UP Button. 5. Now you will see the recovery menu on your screen. From here GO to Wipe > Advanced Wipe > Select Cache, Dalvik, System and Data > Swipe to Wipe. 6. Once the wipe process is completed, Go back to the main menu of TWRP recovery. And Select Install and locate the Custom ROM zip file that you saved on you phone in Step 2 andFlash the same Swipe to Flash option. 7. Now flash the Gapps zip file to install the Google application on your ROM. 8. Once both the zip files are flashed, Wipe Cache and Then Reboot System. Now your phone will reboot, and first boot will take some time. Now your phone is running on the Resurrection Remix Android 6 ROM. Check out the Video Guide Below to install the Resurrection Remix Android 6 ROM.